Camano Island State Park (CISP) - www.parks.state.wa.us/484/Camano-Island a 173-acre camping park with 6,700-feet of rocky shoreline and beach. The park provides sweeping views of Puget Sound, the Olympic Mountains, and Mount Rainier. Comb the beach, watch the boat traffic, or hike the forest loop trails. Make your reservations online. Cama Beach is located on the southwest shore of Camano Island, facing Saratoga Passage. Cama Beach offers visitors a chance to step back in time to a 1930s-era Puget Sound fishing resort complete with waterfront cedar cabins and bungalows. These have been refurbished, with modern conveniences, and are available for rent year round to individuals and groups. Make your reservations online. The Cama Beach Conference Center is the newest building at Cama Beach State Park and is located on the plateau above the water. The Great Hall and Forest Room can accommodate up to 150 guests with tables and chairs, or 200 guests without tables. Individually, the Great Hall accommodates up to 110 guests, while the Forest Room accommodates up to 40 guests, depending on set up. The Forest Room overlooks the Cama Beach forest and features a private entrance. The Cama Beach Quilters (CBQ) began making quilts for the Cama Beach State Park cabins. The Cama Quilters used patterns that resembled those designed over a century ago for the Cama Beach Resort. By the time Cama reopened as a state park, the stock of quilts had grown large enough to furnish all the cabin beds and even included a backup supply so the primary quilts can be laundered regularly. These days the Cama Quilters have expanded their talents to creating quilted tote bags, table runners, wall hangings, pillows and more. Their items can be found at the Cama Beach Foundation Store, at the Welcome Center, and at the new Cama Center. They meet twice a month at the park and welcome visiting people who are interested in quilting. On the last Saturday in July the Cama Quilters host "Quilts on the Beach" at Cama Beach State Park. It's an open-air quilt show where their many quilts are display on the rustic cabins. For several years the quilters have donated a special raffle quilt for Cama Beach Foundation to help CBF raise money for our educational programs. The Cama Cafe, located within Cama Center, has become a favorite location for both park visitors and local community visitors. The Cafe often provides catering for weddings and special group events. You can learn more about their hours and menus from their website. The Cama Cafe is also on Facebook and Instagram. Be sure to check them out. 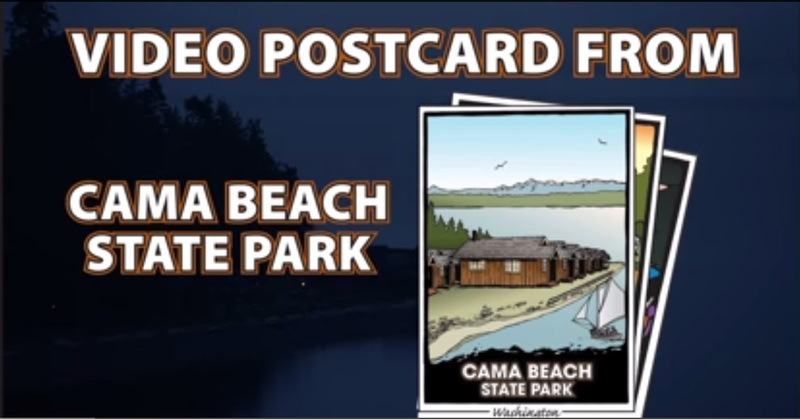 The Center for Wooden Boats at Cama Beach (CWB) partners with Cama Beach State Park to offer boat building experiences, training in using boats, and special events for visitors to parks. See what they are currently doing at their website. Camano Island is home to Friends of Camano Island Parks (FOCIP) a group of residents that provide continual support in maintaining the island's walking trails, both within its two state parks and in several of nearby county parks. FOCIP's mission is to provide stewardship activities, projects, and educational programs that focus on preservation of natural habitats and wildlife, and to advocate for new parks and preserves. You can read more about them at their website. Down 2 Earth Gardeners is a group of volunteers at Cama Beach State Park dedicated to restoring and planting many of the historical plants that were found at this location when it was a resort in the 1950's. Come rain or shine these people are continuously caring for the poppies, red-hot pokers, nasturtiums, and natural wild flowers that reside here; they collect seeds and offer little packets to inquirers whenever possible. Recently they have provided wonderful gardening hints to perpetuate these historical species. They look forward to visitors questions about the native plants of the area. Chat with them when you see them tending plants at Cama. They love to talk about plants. Sound Water Stewards (SWS) of Island County work with our State Parks to support education on the beaches and in the forests. They share the common goal with State Parks to improve, maintain and protect our Puget Sound ecosystem through education, stewardship, and research. You can learn more about them at their website. At both State Parks on Camano Island, the Sound Water Stewards often participate in teaching visitors and especially children about the wonders of the nearshore animals and the life in the forests.